If this ghastly snow keeps piling up, maybe we’ll look like this place on the Tug Hill Plateau. At an elevation of more than 2,000 feet, the plateau is also quite windy. 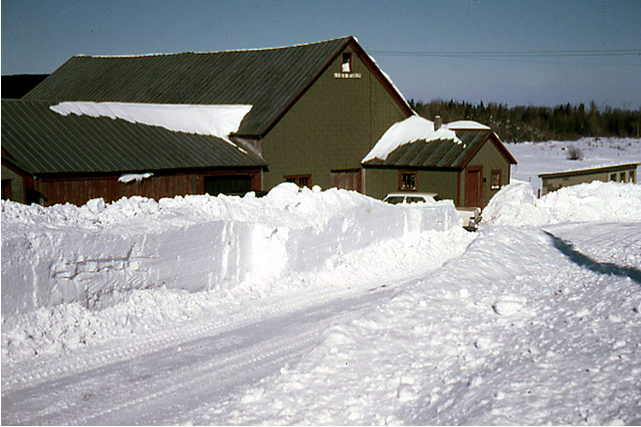 Therefore, Tug Hill has become a haven for cross-country skiers, snowmobilers and … energy production. 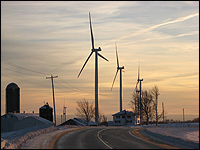 And with almost 200 turbines, The Maple Ridge Wind Farm is the largest such facility in the eastern U.S. Even in this very remote area, the wind farm generated considerable opposition before it became operational five years ago. It reminded me that, for all its promise, “green energy” has a long way to go before it can become a serious player. So, if the burning of fossil fuels should eventually be phased out because of greenhouse emissions and we want to avoid energy sprawl, what does that leave us with in terms of energy sources? Nuclear power is where it leaves us, my friends. I know, I know. That’s not perfect either. But what other options do we really have? What source can provide us with the energy we need to power the world’s economy and not emit greenhouse gases or mar the landscape? nice winter picture. looks just like my father's farm…yes, it is my father's barn! And that is my photo! Small world out there, even on The Tug. Thanks for the photo John. I did include a link to your public Flickr page. Your father must have been especially busy during these months battling winter on The Tug! Energy efficiency and conservation. I know, I know, that's not perfect either. But it's a lot better than being obliterated by the next accident or a slow death of environmental poisoning from nuclear waste. Absolutely. Those are important pieces of the equation. But I don't think they will be enough.